"We've used the WOW Builder to create a couple other web applications, and it usually took us just a couple of hours to build a high-quality application." Wabash National in Lafayette, IN, is one of the leading manufacturers of semi-trailers in North America. Established in 1985, the company specializes in the design and production of dry freight vans, refrigerated vans, flatbed trailers, drop deck trailers, and intermodal equipment. 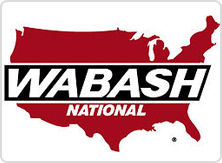 Wabash National maintains an extensive North American sales network, selling its products through factory-direct sales representatives, authorized independent dealers, and a network of factory-owned retail sales outlets. 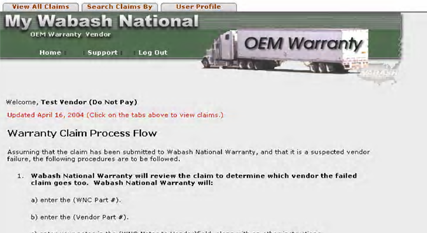 Wabash National Customer Warranty Department used to use MS Access to track warranty claims and claim status among vendors and service centers. claims were being taken over the telephone, fax, or e-mails, which was time consuming, a huge overhead, and generated a lot of paperwork. Therefore, Wabash was looking to build an online OEM Warranty System that would allow service centers and vendors to submit and review claims over the secured internet. In addition, Wabash National Trailer Centers expressed the need of an online Used Trailer website that would allow dealers to view available used trailers real-time. The new system also needed to reduce customer service overhead and provide IBM AS/400 database information to customers over the internet. PlanetJ worked with Warranty IT e-commerce team at Wabash National and developed a sophisticated online Customer Warranty system using PlanetJ's WOW tool. As promised, the system was fully implemented within a short period of time. 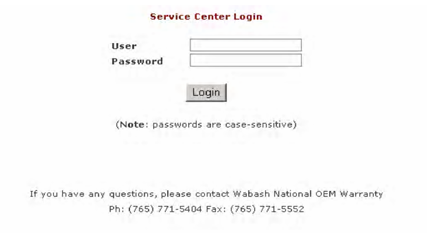 The system allows Wabash National OEM warranty service centers and vendors to submit and review claims 24/7, using a secure, password-protected account. This system offers features that lead to quicker response times and easy-to-use processes. 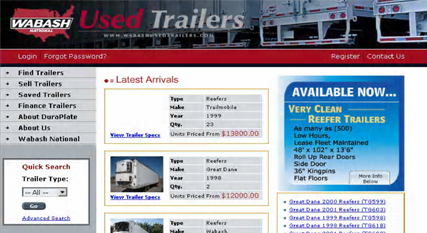 In addition, a Used Trailer website was built that allows customers to view most recent listings, special offers, and/or upcoming used trailers. Through using the built-in self-service features of WOW, authorized dealers can view special dealer prices. Based on customer entry, drill-down lists detailing what is available allows customers to search for used trailers that fits their interests as well as send inquiry e-mails to Wabash sales specialists for specific questions. When Wabash National was looking into various situations, they decided on the use of a web development tool because they did not have an experienced web developer in house at the time. They were looking for a quicker, high-quality delivery and less of a learning curve to IT staff for future maintenance of the developed applications. Through the service system, customers can create warranty claims which are then submitted to the Wabash Warranty Tech for approval. 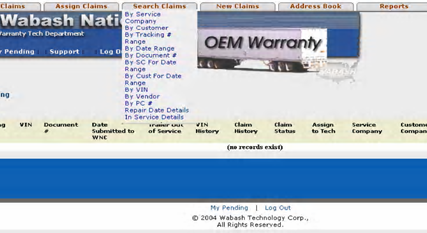 This claim appears on Warranty Tech's secured website where they either approve or reject the claim back to the service center for more information. If the claim appears to be fine, Warranty Tech approves the claim. If a vendor is responsible for a failing part, Warranty Tech forwards the claim to the vendor. The claim is then shown on the vendor's secured website where they either approve or reject the claim, which is then resubmitted back to Warranty Tech. Warranty Tech will finalize the processing of the claim, debit the vendor if needed, issue payments to the service center if the trailer is under warranty. 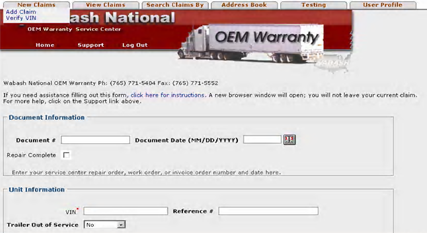 The Used Trailer website serves independently from the Service Center application. From the Used Tailer site, a customer can view a list of arrival, coming-soon, special and banner trailers with available quantities and prices. It is also possible to further drill down to see trailers' specifications. Customers can search for a particular trailer that meets their interests as well as send inquiry e-mails to Wabash sales specialists for detailed information. Authorized WNTC dealers can view more features such as dealer prices. All trailer information ties to backend SAP system. With the WOW Builder, a significant amount of time was saved for developers to enhance the existing Warranty System and Used Trailer website. The WOW Builder also allows for the development of any new, simple, efficient, and easy-to-use web application. Wabash developers went through basic WOW training. Joanna Shi of Wabash National stated: "We were very impressed at how easy it was to use the tool, and surprised at the speed of development and time to production." Since the development of the solutions, she further states: "We've used the WOW Builder to create a couple of other web applications, and it usually took us just a couple of hours to build a high-quality application."